Join the estimated 5,000 people expected to descend upon Croft Farm tomorrow, at Cherry Hill celebrates the 6th annual Sustainable Cherry Hill Earth Festival, from 10 a.m. to 2 p.m. Start the day with the Family Fun Bike Ride (details below), then Celebrate*Learn*Grow when the festival kicks off at 10 a.m.
How can you cut your carbon footprint at the festival? 1. Recycle: E-waste, plastic shopping bags, wire hangers, rechargeable batteries, gently warn shoes will all be collected for recycling or donation. Click here to learn more. 2. Bring your reuseable water bottle: New Jersey American Water will provide free refills! 3. Plant exchange: Bring perennials from your garden to swap for new plants, and take home free compost. Click here for details. We have three acres of displays, activities, entertainment, healthy food for purchase and a guided trail walk at 12:30 p.m. While you're there, don't forget to share your photos and Tweet all the fun to us @SCHEarthFest, and use hashtag #SCHEarthFest! On one final note, this year's festival would not be possible without the support of the dozens of volunteers who will help staff tomorrow's event. I stopped by our annual volunteer appreciation dinner on Tuesday night to personally thank them for their time and dedication - but please join me in thanking them, once again, for helping to make the 2015 Earth Festival our biggest and best yet. For more photos of the volunteer dinner, click here. On Wednesday, people across the globe came together to celebrate the 45th anniversary of Earth Day. Locally, this has been a week dedicated to celebrating the Earth and sustainability, and working to spread awareness of the challenges still facing the global community, despite the progress we've made. On Wednesday morning, about 300 students from Rosa International Middle School came out to show their Earth Day pride and promote tomorrow's Earth Festival by forming a giant "Earth Fest" heart on the grounds of the school. Thank you to Principal George Guy and the faculty, students and staff for their cooperation in making the aerial shot possible. What a beautiful way to celebrate our Earth and the 6th annual Earth Festival! Kick off Earth Fest Day with the Family Fun Bike Ride! If you haven't registered for tomorrow's Family Fun Bike Ride, don't worry: You can walk up and register starting at 8 a.m. at Croft Farm, 100 Bortons Mill Road. Come out with family and friends, and receive a special gift at check-in (while supplies last) courtesy of bike ride sponsor Cherry Tree Corporate Center. Registration opens at 8 a.m. and the ride kicks off at 9 a.m. Click here for more information. Last Saturday, Council members David Fleisher, Susan Shin Angulo and Brian Bauerle celebrated Opening Day at Cherry Hill Atlantic and Cherry Hill American Little Leagues. The final two Opening Day ceremonies for 2015 came on one of the most beautiful days of the year so far, and we were proud to meet the players and coaches and take part in the day's festivities. Best of luck to all of this year's players and coaches, and best wishes for a fun and successful season! View photos from both Little League ceremonies on the Township's Facebook page by clicking here and here. common source of pride. Four decades later, these blossoms remain a favorite of residents across Cherry Hill and have become a destination in their own right. If you haven’t seen them, you are missing out. Visit Chapel Avenue this weekend with your friends and your families, and see how special they are for yourself. 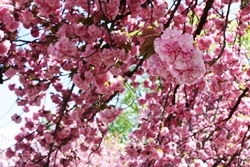 To read more about the history of the cherry blossoms and their special place in our community, click here. Earlier this week, I welcomed a dozen second-grade students from the Politz Day School into my office as part of their class field trip to the Municipal Building. For about a half-hour, the students and I engaged in a lively question-and-answer session and took photos, before they embarked upon a tour of the rest of Town Hall. Their trip included a presentation on Cherry Hill's history, as well as a tour of the Cherry Hill Police Department with our Community Relations Officer. We welcome a number of school tours to Town Hall throughout the year, and I always look forward to the chance to meet our youngest residents and show them exactly how their local government works. The Cherry Hill Arts Board is seeking interested artists to submit artwork for the Art Blooms Juried Art Exhibit, May 2-15 at the Croft Farm Arts Center. Artists may enter up to 3 pieces for consideration, at $10 per piece. A detailed prospectus can be found online at http://cherryhillarts.blogspot.com. Look for more information on this year's Art Blooms events in the weeks to come! For questions or more information, please e-mail Arts@CHTownship.com or call (856) 488-7868. Are you interested in researching your family history, but don't know where to get started? Come out this Tuesday, April 28, when the Cherry Hill Historical Commission presents "Genealogy: Get Ready, Get Set, Get Going," with experts Nancy C. Nelson and Carol M. Sheaffer of the Central New Jersey Genealogical Society. Learn how to get started in genealogy, and where to go from there. The event starts at 7 p.m. in the Cherry Hill Public Library's Conference Center, 1100 N. Kings Hwy. The presentation is free and open to the public; registration is preferred, but not required. For details or to register, call (856) 488-7886, or e-mail CHHC@chtownship.com. Do you knit, crochet or do needlework of any kind? Bring your own needles and any other supplies you need to sit and work on a your project with other crafters. This is not an instructional class. The Needlework Guild meets monthly are on the second and fourth Tuesdays. No registration required. If you enjoy written correspondence and are passionate about keeping the art of letter writing alive, attend this meeting to learn more about LWA. We’ll also discuss upcoming meetings and events and have time to write letters! Some supplies will be provided, but attendees are encouraged to bring their favorite letter writing materials. No registration. Can't make it to our story times during the day? Join us for some of the great stories, songs, and crafts from that week's Little Listeners and Story Time. Best for ages 2-6. No registration. Come enjoy this program of sensory stations for younger toddlers. Bring a towel or change of clothes. One child per caregiver. For walkers under age 2. No registration. We're celebrating International Children's Day! Join us for performances, food and crafts from countries around the world! All Ages Welcome! No registration. Senior Gold Card holders can now access an up-to-date version of the program brochure, 24 hours a day, 7 days a week by visiting the Township website. The directory will be updated monthly, and Gold Card holders who have provided us with their e-mail address will receive a list of new offers by e-mail once a month. Click here to download the brochure. Are you a Gold Card holder? The program, which is free and open to residents 55 and older, entitles cardholders to special discounts at dozens of local businesses. If you don’t have a Gold Card, or for more information on this or any other senior service available to residents in our area, please contact Gaye Pino, senior services program coordinator, at (856) 661-4800, or e-mail gpino@chtownship.com. Cherry Hill and Camden County have partnered to offer free Chair Yoga and Meditation classes for Township residents ages 55 and up. These classes are designed to help incorporate healthy activities into your day, and are open to seniors of all experience levels. Chair Yoga will take place from 1-2 p.m. Wednesday, May 6 and 20. Meditation classes are 1-2 p.m. Wednesday, April 29, and May 13 and 27. Both programs will take place in the N. John Amato Council Chambers (Room 208) at the Municipal Building, 820 Mercer St. Class size is limited; for more information or to sign up, call (856) 488-7868, or email Recreation@chtownship.com. Don't miss the 2015 Camden County Women's Health Conference, on Saturday, May 2, presented by the Camden County Board of Freeholders. Spend the day learning from experts about topics in the areas of health; nutrition & exercise; family; mind, body & spirit; and professional and financial wellness. The day's activities will also include an exhibitor fair, keynote speaker and CBS 3 co-anchor Jessica Dean; continental breakfast, box lunch, giveaways and more! Click here for more information. We have three acres of displays, activities, entertainment, healthy food for purchase and a guided trail walk at 12:30 p.m. While you're there, don't forget to share your photos and Tweet all the fun to us @SCHEarthFest [https://twitter.com/SCHEarthFest] , and use hashtag #SCHEarthFest! On one final note, this year's festival would not be possible without the support of the dozens of volunteers who will help staff tomorrow's event. I stopped by our annual volunteer appreciation dinner on Tuesday night to personally thank them for their time and dedication - but please join me in thanking them, once again, for helping to make the 2015 Earth Festival our biggest and best yet. For more photos of the volunteer dinner, click here [https://www.facebook.com/permalink.php?story_fbid=10153305191499656&id=134342599655] . If you haven't registered for tomorrow's Family Fun Bike Ride, don't worry: You can walk up and register starting at 8 a.m. at Croft Farm, 100 Bortons Mill Road. Come out with family and friends, and receive a special gift at check-in (while supplies last) courtesy of bike ride sponsor Cherry Tree Corporate Center. Registration opens at 8 a.m. and the ride kicks off at 9 a.m. Click here [http://events.r20.constantcontact.com/register/event?oeidk=a07eaougwtxce1ad142&llr=wjf7fucab] for more information. Last Saturday, Council members David Fleisher, Susan Shin Angulo and Brian Bauerle celebrated Opening Day at Cherry Hill Atlantic and Cherry Hill American Little Leagues. The final two Opening Day ceremonies for 2015 came on one of the most beautiful days of the year so far, and we were proud to meet the players and coaches and take part in the day's festivities. Best of luck to all of this year's players and coaches, and best wishes for a fun and successful season! View photos from both Little League ceremonies on the Township's Facebook page by clicking here [https://www.facebook.com/permalink.php?story_fbid=10153294965744656&id=134342599655] and here [https://www.facebook.com/permalink.php?story_fbid=10153295166394656&id=134342599655] . common source of pride. Four decades later, these blossoms remain a favorite of residents across Cherry Hill and have become a destination in their own right. If you haven’t seen them, you are missing out. Visit Chapel Avenue this weekend with your friends and your families, and see how special they are for yourself. 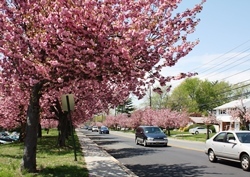 To read more about the history of the cherry blossoms and their special place in our community, click here [http://cherryblossomsincherryhillnj.yolasite.com/] . information or to purchase tickets, call (856) 488-7868, or e-mail Arts@chtownship.com [mailto:] . The Cherry Hill Arts Board is seeking interested artists to submit artwork for the Art Blooms Juried Art Exhibit, May 2-15 at the Croft Farm Arts Center. Artists may enter up to 3 pieces for consideration, at $10 per piece. A detailed prospectus can be found online at http://cherryhillarts.blogspot.com [http://cherryhillarts.blogspot.com/] . Look for more information on this year's Art Blooms events in the weeks to come! For questions or more information, please e-mail Arts@CHTownship.com [mailto:] or call (856) 488-7868. Are you interested in researching your family history, but don't know where to get started? Come out this Tuesday, April 28, when the Cherry Hill Historical Commission presents "Genealogy: Get Ready, Get Set, Get Going," with experts Nancy C. Nelson and Carol M. Sheaffer of the Central New Jersey Genealogical Society. Learn how to get started in genealogy, and where to go from there. The event starts at 7 p.m. in the Cherry Hill Public Library's Conference Center, 1100 N. Kings Hwy. The presentation is free and open to the public; registration is preferred, but not required. For details or to register, call (856) 488-7886, or e-mail CHHC@chtownship.com [mailto:] . [http://www.thesuccessfulfailures.com/blog-wp/] Come enjoy this program of sensory stations for younger toddlers. Bring a towel or change of clothes. One child per caregiver. For walkers under age 2. No registration. [http://www.thesuccessfulfailures.com/blog-wp/] We're celebrating International Children's Day! Join us for performances, food and crafts from countries around the world! All Ages Welcome! No registration. Senior Gold Card holders can now access an up-to-date version of the program brochure, 24 hours a day, 7 days a week by visiting the Township website. The directory will be updated monthly, and Gold Card holders who have provided us with their e-mail address will receive a list of new offers by e-mail once a month. Click here to download the brochure. [http://www.cherryhill-nj.com/documentcenter/view/350] Are you a Gold Card holder? The program, which is free and open to residents 55 and older, entitles cardholders to special discounts at dozens of local businesses. If you don’t have a Gold Card, or for more information on this or any other senior service available to residents in our area, please contact Gaye Pino, senior services program coordinator, at (856) 661-4800, or e-mail gpino@chtownship.com. Cherry Hill and Camden County have partnered to offer free Chair Yoga and Meditation classes for Township residents ages 55 and up. These classes are designed to help incorporate healthy activities into your day, and are open to seniors of all experience levels. Chair Yoga will take place from 1-2 p.m. Wednesday, May 6 and 20. Meditation classes are 1-2 p.m. Wednesday, April 29, and May 13 and 27. Both programs will take place in the N. John Amato Council Chambers (Room 208) at the Municipal Building, 820 Mercer St. Class size is limited; for more information or to sign up, call (856) 488-7868, or email Recreation@chtownship.com [mailto:Recreation@chtownship.com] . Don't miss the 2015 Camden County Women's Health Conference, on Saturday, May 2, presented by the Camden County Board of Freeholders. Spend the day learning from experts about topics in the areas of health; nutrition & exercise; family; mind, body & spirit; and professional and financial wellness. The day's activities will also include an exhibitor fair, keynote speaker and CBS 3 co-anchor Jessica Dean; continental breakfast, box lunch, giveaways and more! 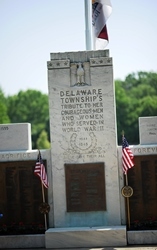 Click here [http://www.camdencounty.com/WHC2015] for more information.